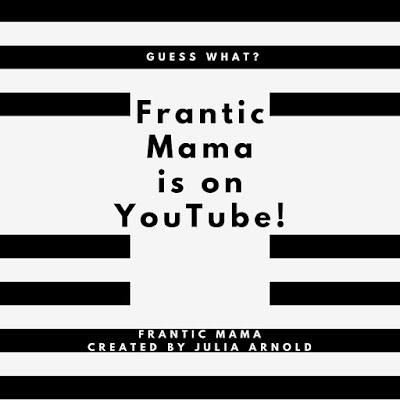 Frantic Mama: I'm on YouTube! Yes, it's true: I decided to create my own YouTube Channel. It's about all things Frantic Mama. We'll see how it goes... I love to learn new things and to be creative, and making videos is another way to do that. I'm curious to learn more and see if people enjoy it. If you subscribe, you'll get updates when I add new videos. Oh! Julia this is just so so so much fun! Loved loved hearing you too. Subscribed!!!! �� can't wait for more. Love your poem recital! It is magical! Thank you so much! I must say, it's an intimidating thing to watch yourself on screen as you talk. It's hard not to focus on every little insecurity! Hopefully with practice, my video skills will improve and I won't be worried about flaws...I have other ideas brewing, and I am so glad you'll be following along!